Baku, April 15, AZERTAC Azerbaijan’s national air carrier has held a presentation in Riyadh entitled “Azerbaijan through the eyes of a falcon”, which presented new routes of Azerbaijan Airlines to a number of cities in Saudi Arabia. The event was attended by a delegation of AZAL, led by Vice-President Eldar Hajiyev, representatives of the two countries’ governments, the diplomatic corps, mass media, and others. Modern tourism opportunities for organizing recreation and leisure in Azerbaijan, including beach, ski, medical and historical tourism were presented to the audience. The presentation video “Azerbaijan through the eyes of a falcon” was shown at the event. The event participants were provided with information about Azerbaijan’s civil aviation infrastructure. They were also able to taste the culinary masterpieces of Azerbaijan. Addressing the event, AZAL Vice President Eldar Hajiyev noted that thanks to Azerbaijani President Ilham Aliyev’s constant attention and support, civil aviation of the country achieved great successes. 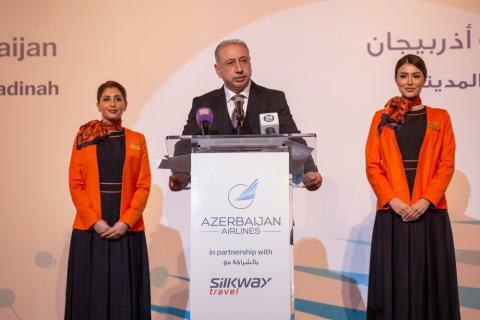 Last year, Azerbaijan Airlines was confirmed the prestigious 4-Star airline status and according to the British Skytrax Agency, the Airline was named the best regional airline in Central Asia and India. According to him, Heydar Aliyev International Airport received high international recognition, being awarded the maximum 5-star status by Skytrax and becoming the ninth airport in the world with such an assessment. Heydar Aliyev International Airport is the undisputed leader of the region in the field of passenger and cargo transportation. “Our peoples have a common religious and cultural heritage, common spiritual values. The opening of new destinations, as well as the simplified visa regime will significantly increase the tourist flow and business relations between the two countries,” Eldar Hajiyev said. AZAL opens many new regular and charter flights to the Arab countries, six of which to the Saudi Arabian cities of Riyadh, Dammam, Jeddah, Madinah, Buraydah (Al-Qassim) and Al-Hofuf. The flights to Saudi Arabia will be carried out with modern Airbus A319/320 and E190 aircraft according to the following schedule: • Baku-Jeddah-Baku - on Mondays (starting from April 8); • Baku-Madinah-Baku - on Wednesdays (starting from June 5); • Baku-Dammam-Baku - on Fridays (starting from June 7); • Baku-Riyadh-Baku - on Mondays (starting from June 10); • Baku-Al-Hofuf-Baku - on Sundays (starting from June 9); • Baku-Buraydah (Al-Qassim)-Baku - flight schedule to be announced later. The Kingdom of Saudi Arabia is also known as the “land of two shrines” - the legendary Madinah and Mecca, where Muslims come from all over the world during the pilgrimage. Saudi Arabia also attracts lovers of sightseeing holidays with the opportunity to appreciate unprecedented luxury, admire original architectural ensembles and immerse themselves in the amazing atmosphere of the East. To purchase air tickets for regular flights, visit the Airline’s official website www.azal.az, while for charter flights - the sales offices of the general agent of AZAL, Silk Way Travel company. 24-hour Call Center: (+994 12) 598 88 80, e-mail: [email protected] Messages can also be sent via WhatsApp: (+994 70) 437 40 82.